Burgess Excel Ferret Nuggets is a super-premium single component extruded diet for ferrets which helps prevent selective feeding and is fully supplemented for optimum health. 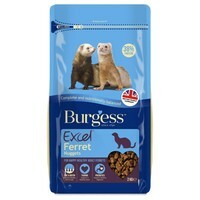 Containing high levels of quality chicken to provide essential high protein levels that ferrets need, Burgess Excel Ferret also contains special prebiotics to stimulate the beneficial gut bacteria, and additional Taurine to maintain overall coat condition. Burgess Excel Ferret Nuggets have also been fortified with vitamins A, D3 and E to nourish healthy skin, coat, teeth and bones.